Among David Mamet’s many stage plays, “A Life in the Theatre” is anomalous: a light-hearted trifle from 1977 without the zesty streams of obscene invective and emotional violence for which Mamet is well-known and widely parodied. With its small cast, short scenes, and minimalist dialogue, it is familially related to “Sexual Perversity in Chicago” (1974), a loosely structured series of comic sketches about relationships that gave Mamet his first notable success (much thanks to the punchy title). Two actors in a repertory company share a dressing room over the course of several years. We see them backstage, offstage, and on stage as they rehearse, perform, decompress, and conduct a friendship that evolves in a meandering way. Robert is older and given to dispensing theatrical wisdom and advice. John starts out as polite protégé and eager apprentice, then morphs over time into confident colleague, ambitious up-and-comer, exasperated roommate, and accepted equal. 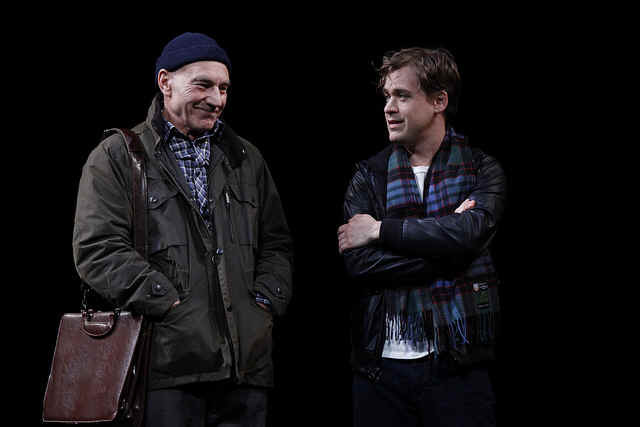 The Broadway revival of “A Life in the Theatre” was mounted exclusively as a star vehicle for Patrick Stewart (below left), and the best thing can be said about it is that it supplies an opportunity for his legion of fans to worship him in person. And boy do they! At the matinee I attended, the audience hung on his every word, prepared to greet every tiny piece of stage business with loud appreciation. When he came out in tights and purple leggings for a scene in which he and his fellow actor do their stretches at a ballet barre, you would have thought that no funnier sight gag had ever been performed on a Broadway stage. OMG, Captain Picard in tights and purple leggings!!! Not being a Trekkie myself, I was expecting a more nuanced performance, but no, it’s pretty much of a personal appearance for the fans.